One of our friends has five gorgeous kids. They all model. In fact, they are in such demand that the youngest was already booked for jobs before she was born! I saw an email my friend received from a diaper company requesting her as soon as she popped out. Thatâ€™s in demand! So since my friend is so entrenched in the industry people began asking her for advice. Which led to her opening her own talent agency. She reps around 100 kids, and last year she asked to rep Averi. I resisted for a while. Averi has an obscene amount of confidence, which isnâ€™t all warranted (although donâ€™t get me wrong, if she becomes a super star singer I will be thrilled), and I didnâ€™t want to risk her losing it by having constant rejection. In the end though, Michael and I decided that it could be fun to let her go on a couple of casting calls, as long as they were convenient. And they have been fun. In the same way that sitting in PTA meetings and watching people fight with each other is fun. Because these moms be crazy. They are the ultimate stage moms! I have met numerous moms who drive hours to take their kids to a casting. I wonâ€™t drive over 30 minutes. They come with numerous outfits and a full bag of hair and makeup. Averiâ€™s first casting we went to straight from tennis, in shorts and a tank top, messy hair. We met with a talent manager who loved Averi, but said we would need to get her flippers (fake teeth) in order for her to send her out. She has not been sent out. ðŸ™‚ But numerous kids we have met do have the fake teeth. And Kayla and Alicia love their unity smile! We may or may not continue to go to castings. So far there have been solid reasons for every one we have gone to as to why Averi hasnâ€™t been booked, so she still has a very high opinion of herself. And like the pta meetings, I do enjoy the crazy. I have no segue way from this to my recipe, so Iâ€™m just going to say that I just made a second batch of Tropical Pineapple Muffins. The first batch was just Pineapple Muffins. 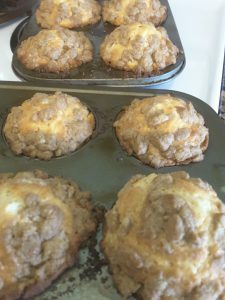 I was suppose to use canned pineapple and the juice from the can, plus only put the pineapple on top of the muffin,Â with the streusel topping. I had fresh pineapple that I was trying to use up, but there was enough juice that had dripped out (is that the right way of explaining it) that I had it. And while Averi loved them and has asked to have them as dessert, Michael complained the muffin base was dry. So I decided to try again. This time I replaced the pineapple juice with mango tangerine juice that I had in the refrigerator, because I thought that would be more flavorful then just pineapple drippings. And make it more MOIST. And if Aimee is reading this, thatâ€™s why the word MOIST was in caps. ðŸ™‚ I also mixed the pineapple into the batter, instead of just on top. Again, thinking it would make them more flavorful and moist. And it did! 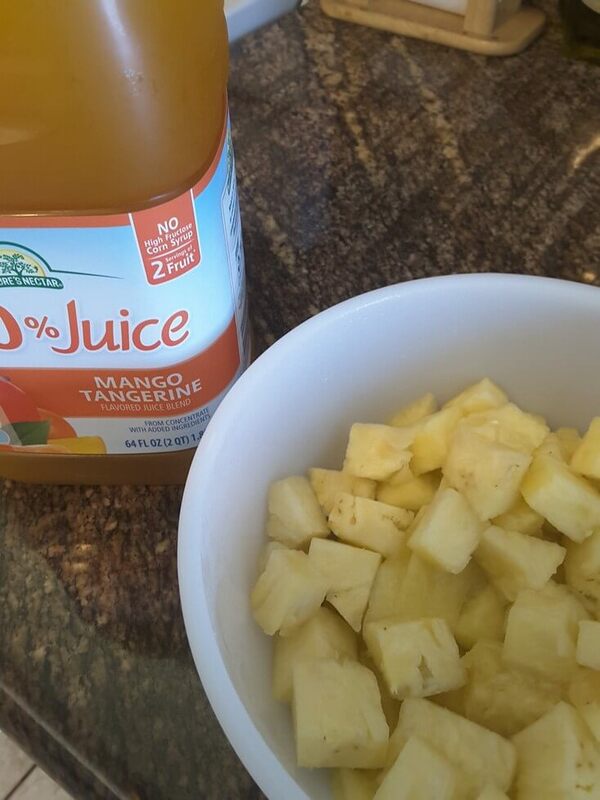 I donâ€™t even really like pineapple, but the tropical flavor was great. 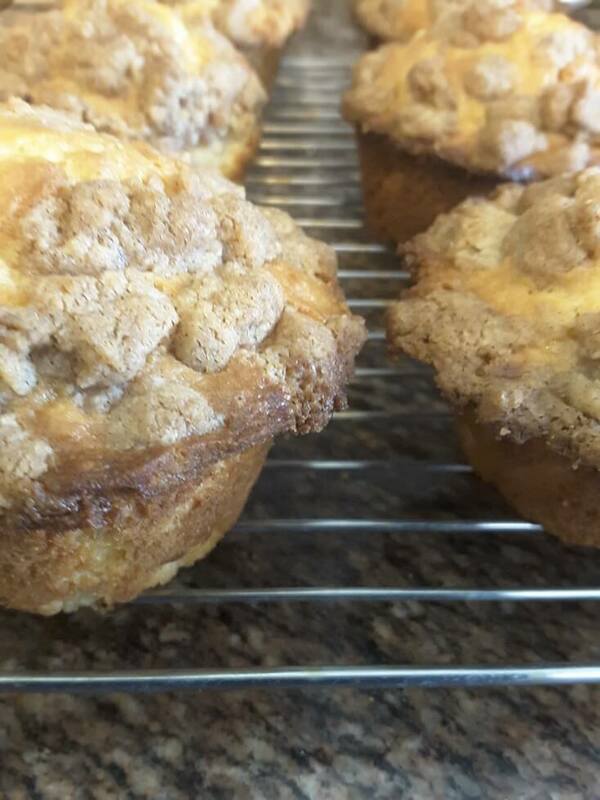 Plus you have the streusel topping, for a nice crunchy muffin top. preheat oven to 375. Grease muffin tins, or use liners. In a medium size bowl, mix 2 cups flour, sugar, baking powder and salt. Make a well in middle of dry ingredients and add juice, egg, milk and 1/4 cup melted butter. Stir till combined. In separate small bowl, mix the remaining 1/4 cup melted butter, cinnamon, brown sugar and 1/2 cup flour till all combined. Pour muffin batter into prepared muffin tins. Sprinkle browns sugar topping over top.